It's officially confirmed! Alicia Keys is going to be the most beautiful mama ever! 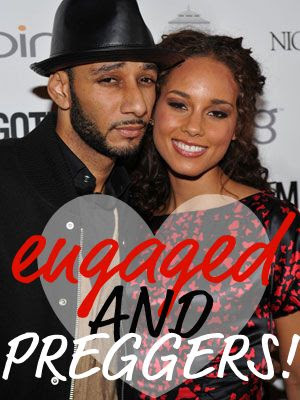 She confirmed tonight that her and Swizz Beats are engaged AND expecting a lil one! The baby bump pictures were totally real! I can't freakin' wait to see her all big and preggers... And imagine her wedding pictures! ...Okay, I need to calm down. I'm pumped, that's all. Often when two good-looking people hook-up their offspring turns out kinda fugly. And have you noticed how two not-so-pretty people tend to produce gorgeous kids?!?!?! Wierd huh!